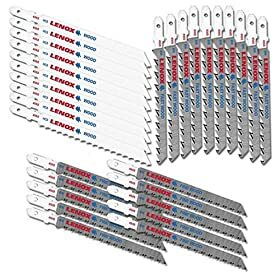 The Lenox Wood Jig Saw Blades includes: 10 4-by-5/16-.058-inch (LxWxT) blades with 10 teeth-per-inch; 10 4-by-5/16-by.058 inches (LxWxT) blades with 6 tpi; and 10 4-by-3/8-by-.050 (LxWxT) blades. They are meant for cutting wood, plastic, and composite material. These chromium-steel jig saw blades are also single-piece ground for more precise and consistent teeth. This allows smooth, clean cuts with greatly reduced deflection on curved cuts and thick material. For consumer confidence, this product is backed by a 90-day limited warranty. 10 4-by-5/16-.058-inch (LxWxT) blades with 10 tpi; 10 4-by-5/16-by.058-inch (LxWxT) blades with 6 tpi; and 10 4-by-3/8-by-.050 (LxWxT) blades. 50% in a couple of months whats up with that. any way the blades work great but i won't buy them at the new price. For general purpose blades, you can't go wrong with this set. Lenox quality at an affordable price. 30 PACK MEANS EVEN WHEN THE BLADE GETS A LITTLE DULL --- JUST TOSS IT.